Another day, another need to use radishes from the backyard ‘winter garden’. I’ve pickled so often I was looking for something new (and not everyone wants a acidic, fiery pickle as often as I do…), and browsed a few articles about braised daikon like this one on Serious Eats. I included a tablespoon of rice in a tea strainer in the same pot– copied from an article above though without really thinking what it would be doing– making the water starchier because ______? In parallel, mix 1 Tbsp of miso paste, 1 Tbsp of butter, 1 tsp vinegar (I used a white wine vinegar I’d made), and a few tsp water and briefly heat on low to make a glaze, adding a little water to get the consistently, then cover the drained radishes and serve. Broth: a savory chicken stock from the last time we roasted a chicken + kombu + dried porcini mushrooms + celery + carrots + onions + the radish greens, simmered on low for about 3 hours, then strained and seasoned with salt, soy sauce, miso. Into the Broth: Soft-boiled eggs, flower-cut carrots, roasted baby carrots, sautéed broccoli, and soba noodles (boiled in water and drained in cold water). 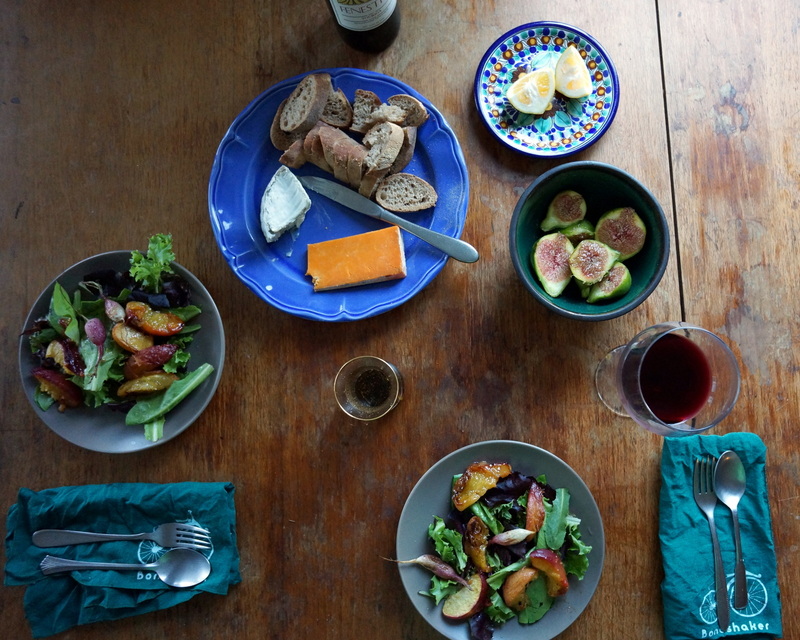 For dinner: bread, cheese (Humboldt Fog and a Neals Yard cheese that wasn’t their cheddar), mixed greens with roasted peaches and radishes, and a bowl of figs. It was a good day for food (and, alas, my first time cooking in a few weeks). Another (busy-at-work, forgot-to-invite-anyone-over) Tuesday CSA, another attempt to cheat time with the pressure cooker. I’d give this one a B+. Similar to the last lentil soup: I sauteed some home-cured-by-a-friend and deliciously fatty/salty lambcetta, shallots, celery, carrots, and onions. 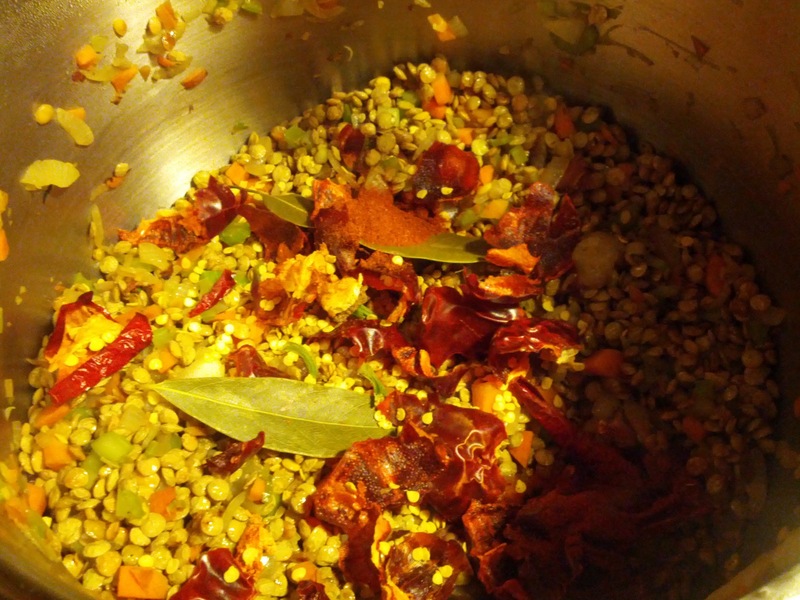 Then I sweated a pound of lentils with it over medium heat for 5 minutes. 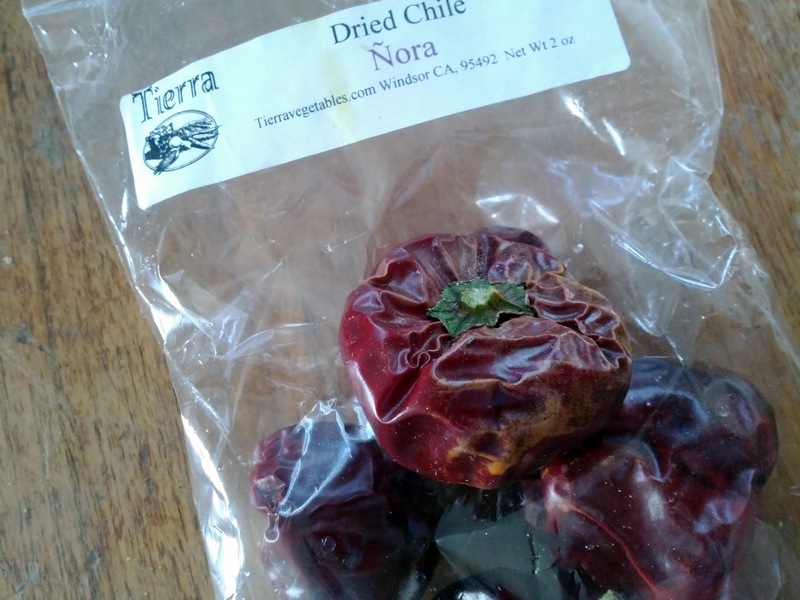 Plus a few dried Nora peppers, chipotles, cayenne, a pinch of smoked paprika, 8 cups of water, and the lid came on, for 10 minutes at pressure. I opened it, added salt and black pepper to taste, and simmered it another 5 minutes. A whole Meyer lemon squeezed into the bowl for the last-minute acid. Pretty good. Could have used more meat or a meaty stock. To go along with it, a salad with lettuce, fennel, pea sprouts, watermelon radish (refreshing & fun to look at), balsamic. And some lemon-anise hard candies from Miette. Okay, too much eating out, back to cooking (mostly from the Tuesday CSA). I meant to invite a few friends over but didn’t plan ahead. Spigarello greens, which taste uncannily like broccoli, but not bitter (shredded and sauteed with about 8 cloves of crushed garlic until just starting to wilt). Sauteed four thin-sliced shallots in the open pressure cooker, added half a pound of lentils (no liquid), and sweated them over medium heat for about 5 minutes, stirring. 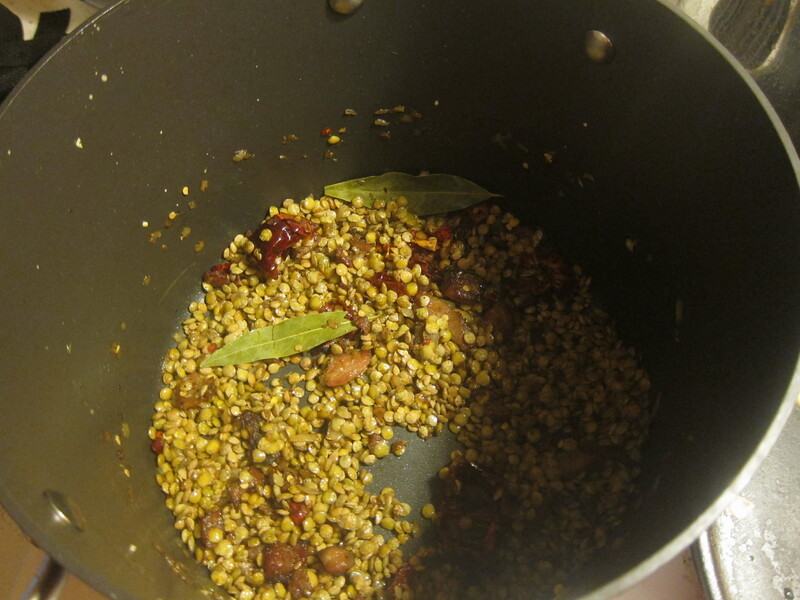 Then I added some dried peppers (nora, guajillo), two bay leaves, and four cups of water (I didn’t have any stock or pork to add). I closed the lid, brought it up to steam temperature, cooked for 10 minutes, then did a quick release of the pressure by running the pot under cold water. Hey, the lentils were perfectly done this time, with good texture and a little liquid still remaining… but blander than I wanted. Browsing the cupboards, I added a heavy pinch of cayenne powder, a bit more salt, a quarter of the dark beer, a little sauteed garlic from the spigarello, and a dash of cholula. After about 5 more minutes of simmering on low, I tasted it– spicy, and pretty good! I added juice from a meyer lemon and it was even better. 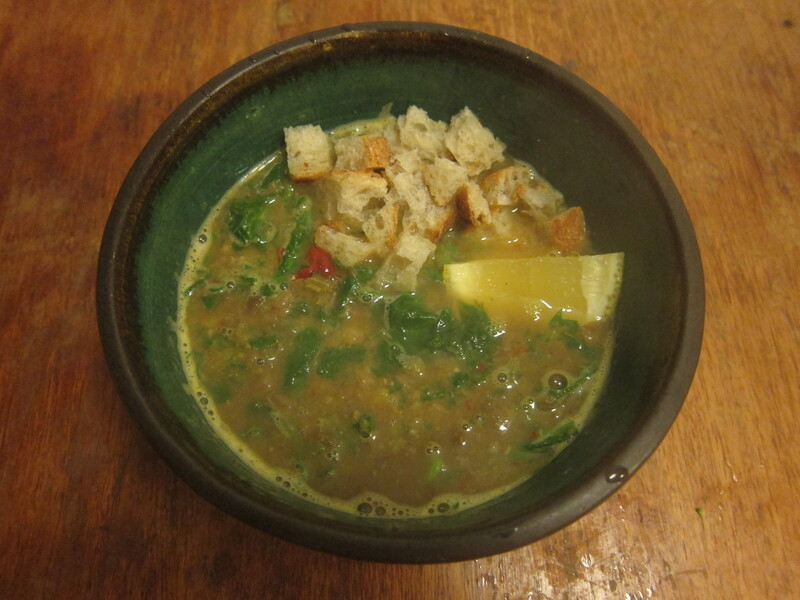 I have mixed luck with soup, but this weekend I made the best lentil soup I’ve had. 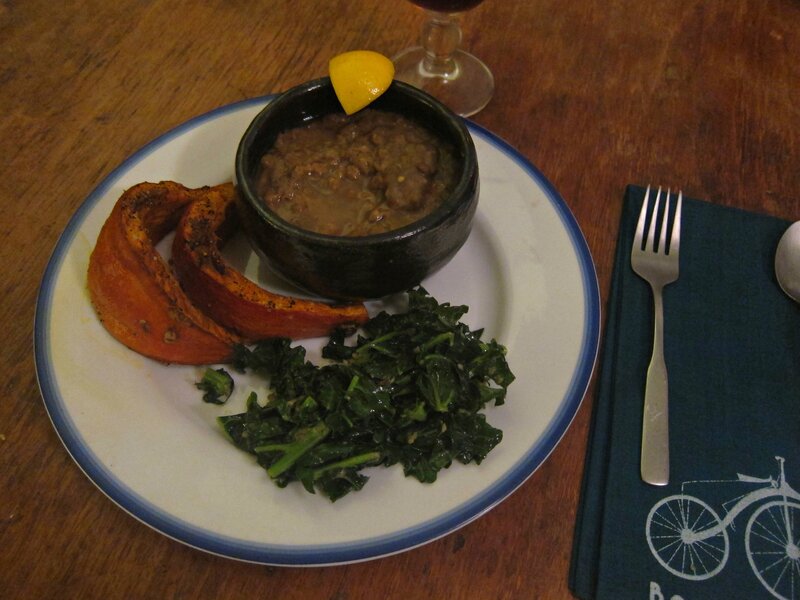 And no, that’s not intended to be damning-with-faint-lentil-praise — it was delicious. I cut two strips of bacon into pieces and cooked them until done but not crispy. I sauteed two minced shallots in the bacon fat (with the bacon still in) a few minutes until translucent, added 3 cloves of crushed garlic, 2 bay leaves, a crushed dried nora pepper from Tierra Farms, and about 1tsp of whole cardamom seed, turmeric, and cayenne powder, a little black pepper, and sauteed/toasted that for a few minutes. 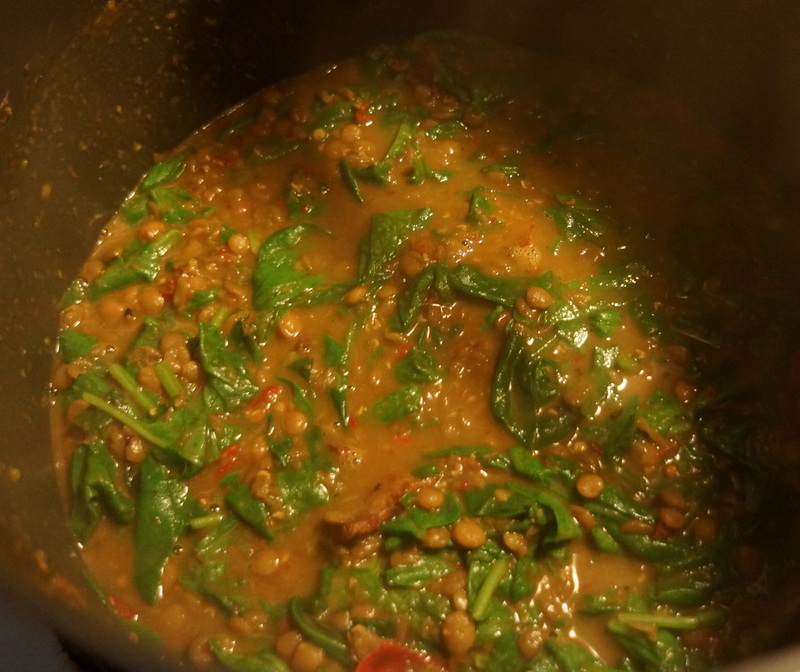 I sorted and rinsed a cup of lentils, then added them to the spices (without any other liquid) and cooked them for about 8 minutes on medium, stirring. 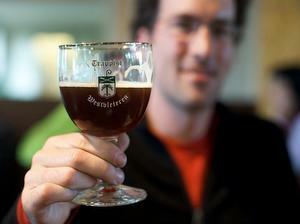 This was the “sweating”. Then I added about 1/4 cup of cooking rice wine, 2 cups of chicken stock, 3 cups of water, brought them to a boil, then turned it down to a simmer and cooked for about 20 minutes– the lentils were tender but not mushy or falling apart. 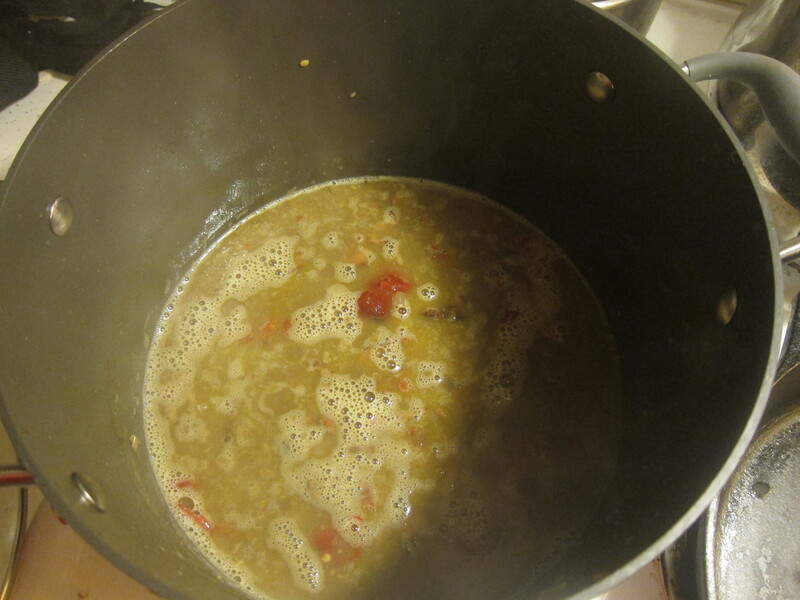 I fished out the bay leaves, then used an immersion blender to blend a small amount of the soup. Finally, I tossed in a whole head of spinach (rinsed and de-stemmed), and gave it 2 minutes in the simmering soup to slightly wilt. 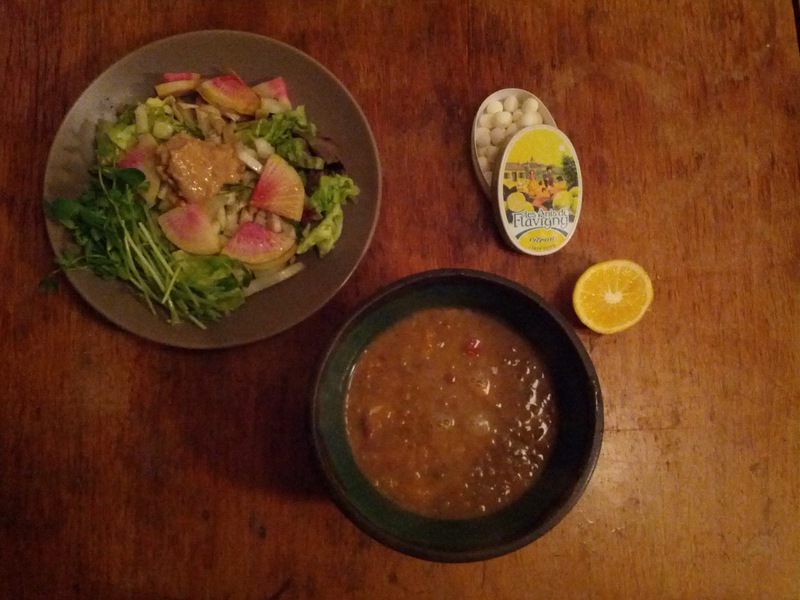 At this point, it was already good, but I squeezed a quarter lemon’s worth of juice into the bowl before eating and it was even better (addition of something acidic had worked well when I made black bean soup). I also chopped up some stale bread I had. 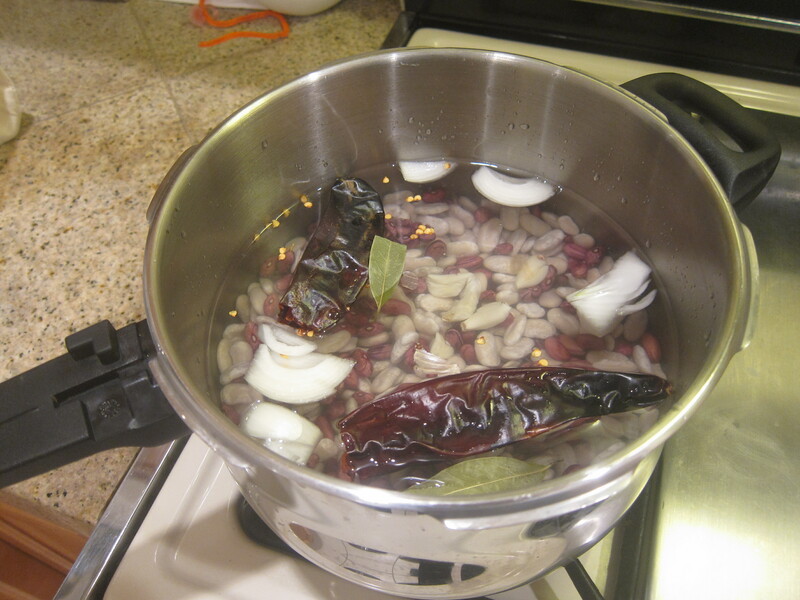 A mix of classy-looking anasazi beans and white navy beans from Tierra Farms, soaked for about 12 hours, drained, then combined with 3 cups water per cup beans, half an onion, two bay leaves, two dried guajillo chiles, a few garlic cloves. Pressure cooked for 15 minutes (from the time the steam started escaping), which it turns out was longer than needed– they were very soft by the end of this. 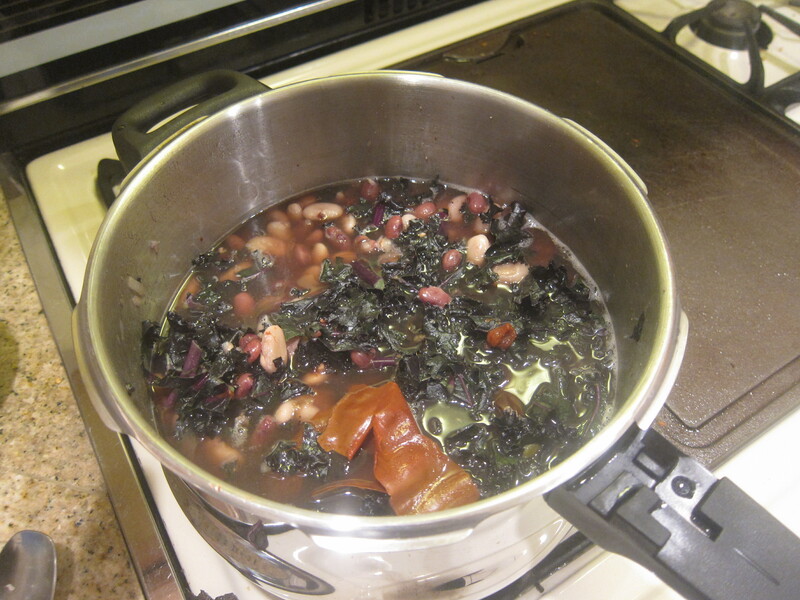 At the same time, a few slices of bacon, a diced onion, and a few cloves of minced garlic were fried, then mixed into the cooked beans along with a shredded head of red kale, some paprika, oregano, salt, and pepper, and simmered for another 20 minutes or so. Good, though it could have simmered for longer. I’ll see how it is after sitting a day. 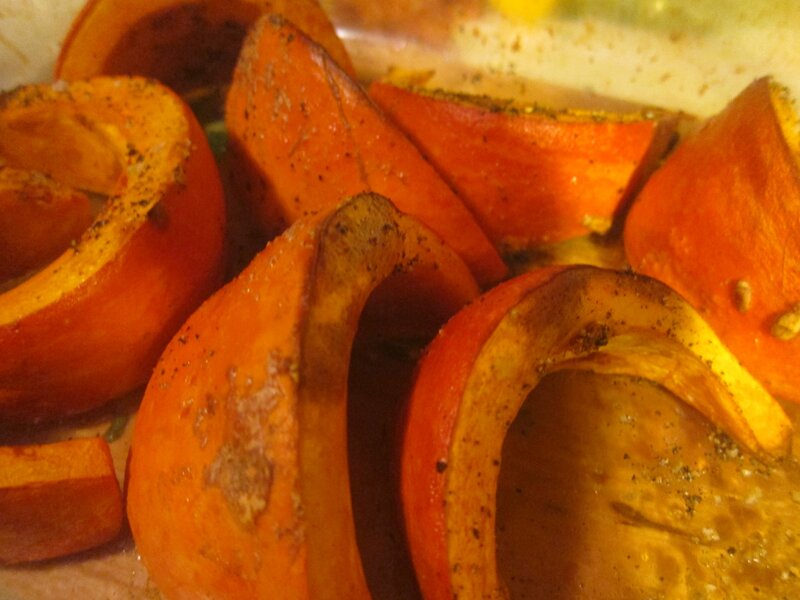 Also part of dinner: squash (butternut squash cut in half, rubbed with sesame oil, salt, and pepper, and roasted at 400F until soft– about 30 minutes. 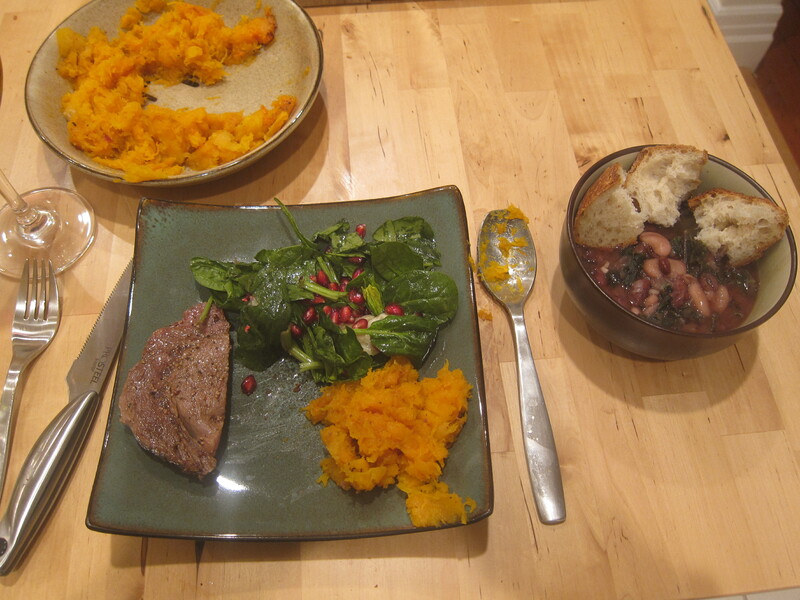 Kept in the fridge for a day, then reheated and mixed with a bit of maple syrup), a steak (seared on a stovetop grill), salad (spinach, pomegranate seeds, olive oil, white balsamic vinegar), Acme sourdough, tea, wine, and chocolate. A simple feast with friends, from about an hour of evening-cooking effort. Soup of sauteed onions/garlic/carrots, kidney beans (white and black, half mashed), chicken broth, sage, parsley, and roasted garlic precooked sausage, simmered together for 10-15 minutes. 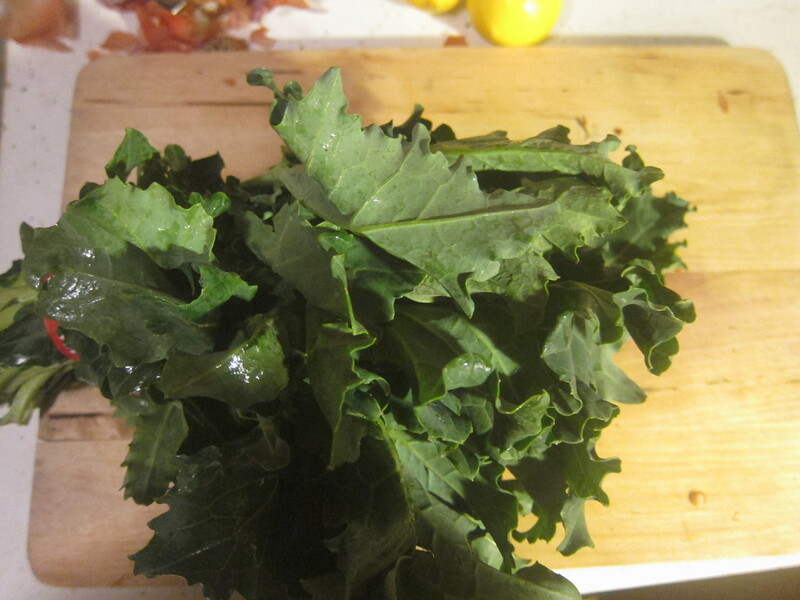 Then a full head of shredded escarole was added for another 5 minutes (covered). And hey, the rest of the soup actually managed to keep the escarole in check and mask the bitterness. Roasted broccoli, cauliflower, and cabbage (I’d never tried roasting cabbage– crispy/soft and delicious).